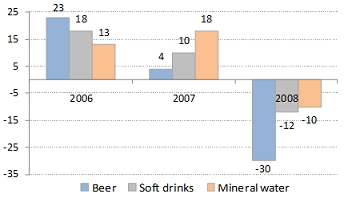 The markets of beer, soft drinks and mineral water have recorded during 2006 the following development trends: 23%, 18% and respectively 13%. One year later the situation recorded opposite shifts, as the highest value of market growth corresponded to the mineral water, namely 18%, followed by soft drinks with 10% and beer – 4%. The peak for the consumption of these three products was reached during 2007, as already in 2008 can be traced a significant decrease for the market of beer - by 30%, followed by soft drinks and mineral water, of respectively 12% and 10%. In this context, it can be stated that the level of consumption of mineral water and soft drinks has reached in 2008 respectively 12.2 mil. dal and 8.9 mil. dal., while the consumption of beer equaled to 9 mil. dal. The same numbers determine that the level of consumption per capita equals to: 36 l for mineral water, 26 l for soft drinks and 27 l for beer. Although, a tendency of market volume decrease is noticeable for the three types of products, it cannot be ascertained that the preferences and capacity for consumption of Moldovans have changed significantly. A reason for the decrease could serve the fact that during the summer of 2008, the temperatures recorded were rather low. Following this order of ideas, the influence of the world financial crisis should also be mentioned as a factor disturbing the consumption pattern. If estimating the market volume for these 3 products, an increase of 6-7% could be forecasted during 2009. However the financial crisis will affect the growth rates of these markets, lowering their values. Referring particularly to the consumption patterns of soft drinks and beer, they are strongly correlated to the variations of temperatures during the season, as the consumption of these drinks has a seasonal feature. It is to remark that the variation of the outside temperatures influences the consumption of these drinks as much as 87%. However, considering the macroeconomic situation, it is to expect that these products will be substituted with some cheaper alternatives, and in some cases they could even be given up. There is a multitude of brands on these markets, but it is to be mentioned that on each of them there is only one key player: Efes Vitanta Brewery and The Coca Cola Company which hold more than half of the market. This distribution of market shares is explained especially by the fact that Efes Brewery Group purchased the majority stake of Vitanta Intravest and by the further sale ofViva and Real brands to the Coca Cola Company. Therefore, the markets of beer and soft drinks have a high level of concentration, conditions under which it is very difficult for new players to emerge in the market. At the same time, we could refer to a classic example of globalization, when transnational companies, without much effort, tend to occupy the leading positions in certain markets. However, on the market of mineral water the leading position is in the hands of a local company – Rusnac Moldaqua, with its main brand Gura Căinarului. Referring to the data collected via Magenta National Screening (1400 respondents from 24 urban communities of Moldova) it can be stated that the most notorious brandson the beer market are: Bere Chișinău known by 84% of respondents, Baltica (48%) and Tuborg (29%). Among soft drinks the most well-known brands include Coca Cola (68%), Viva, Fanta and Sprite, each named by 45% of respondents. As regards the mineral water, the leading position is held by the Gura Căinarului brand, specified by 87% of the study participants. With regard to the consumption pattern, the preference top for beer remains similar to the top about brand’s level of awareness: Bere Chișinău holds the first position with 41%, Baltica - 14% and is ranked the 2nd, while Tuborg, reaching 7% of the purchasing preference, covers the 3rd position. The top for soft drinks looks in the following way: Viva is bought by 25% of respondents – therefore this brand is positioned first in terms of preference, then comes Coca Cola, Sprite and Fanta (accordingly with 15%, 10% and 6%). The list is completed by Letto and Prigat, each mentioned by 6% of the interviewed. This positioning of brands could be explained by the fact that Moldovan consumers are oriented towards cheaper products and with “natural” ingredients. 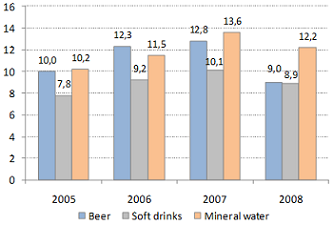 The third analyzed product – mineral water includes in its top Gura Căinarului with 49%, followed by Dorna with 13%. The same study revealed that in terms of flavors, the most preferred soft drinks are those with exotic fruits aroma – 46% indicated so, while for beer – the large majority specified the filtered, light beer – 75%. Also in terms of beer, the minorities among respondents expressed their preference towards the unfiltered, dark beer, which is supplied on the market in rather limited quantities. The effect of the advertising campaigns depends largely on their quality and consistency and not on the fact whether they were launched or not. In order to achieve the desired effect, i.e. to produce the promotional Big Bang, the promotional messages have to be launched at the proper time, and most important, the informational and emotional charge they carry should impel the consumer in choosing that specific product that is advertised. But, no matter how good the message is, it is considered worthless if it doesn’t reach the target-consumer. In order to be sure that this situation doesn’t happen, here interferes the media plan, a tool that would maximize the information flow received by the target consumer. At its turn, in the Republic of Moldova, the media plan is almost canonized. This tool is proposed by advertisers as a mystical prayer, somewhat like a spell that brings success. Otherwise stated, a client receives a set of new words and numbers, which are considered as the best solution for that client. But sometimes, the client might not even understand the meaning of the received data. The majority of clients are somewhat forced to place their ads on TV, a type of media which handles large amounts of money. Besides TV, another solution for advertising could serve also the PR, which also is a mystical area for the Republic of Moldova and to which we’d come back another time. An effective advertising campaign requires financial resources, not because of the cost of ad placement on TV, but because there should be carried out consumer researches, then has to be established the specialization of the company, also resources are needed for the production and testing of goods/services, and for the post-campaign evaluation. I would like to bring up 2 examples of advertisements that reach their goal: „Berea Chisinau”, which perfectly spots the consumer and complies with all classic standards, which is probably assigned to the Republic of Moldova and „Berea Carlsberg” (”probably the best beer in the world” – a very well thought slogan), which I envision as one of the best spots. But again, every product has its consumer. If we are to analyse the advertisement for mineral water, I would put an emphasis on „Gura Căinarului”, which, besides all advertisement components, presents to the consumer sneak peeks on extraction and production, a classical advertisement tool with major impact. At this point I believe it is a national brand. The advertisement of soft drinks is very alike and brings up the idea of the taste and dynamism. Nevertheless I would highlight „Coca Cola” which does not do any advertisement anymore; it only maintains its position on the market. In conclusion, according to our estimations, during 2009 there will be recorded an insignificant increase in the market volume of beer, mineral water and soft drinks, around 6-7%. Also, the emergence of new participants on the market is not likely to happen, due to the high competitiveness on these markets. It should be noted that on the background of domestic production shrinkage and imports increase, the only significant changes that could incur deal with the market share of competitors. And, of course, preference would be given to the products with lower prices. There is only one thing that would stir the consumption of these products, and no matter how trivial it may sound, it is the influence of the outside temperatures. During this study, the team of Magenta Consulting decided to test the influence of this factor on the market volume or on the consumption level. Either it is obvious or not, it was proved that the temperatures can significantly promote the sales of liquids. Therefore, high temperatures combined with a well thought advertising campaign and an efficient price manipulation could provide the market players with the expected success.